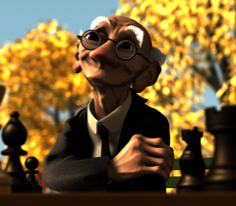 The creation of believable and endearing characters in computer graphics presents a number of technical challenges, including the modeling, animation and rendering of complex shapes such as heads, hands, and clothing. Traditionally, these shapes have been modeled with NURBS surfaces despite the severe topological restrictions that NURBS impose. In order to move beyond these restrictions, we have recently introduced subdivision surfaces into our production environment. Subdivision surfaces are not new, but their use in high-end CG production has been limited. Here we describe a series of developments that were required in order for subdivision surfaces to meet the demands of high-end production. First, we devised a practical technique for constructing provably smooth variable-radius fillets and blends. Second, we developed methods for using subdivision surfaces in clothing simulation including a new algorithm for efficient collision detection. Third, we developed a method for constructing smooth scalar fields on subdivision surfaces, thereby enabling the use of a wider class of programmable shaders. These developments, which were used extensively in our recently completed short film Geri's game, have become a highly valued feature of our production environment. Available in the Proceedings of SIGGRAPH 1998.